Here is another project I got on my weekend trip. I just love the shape of these cappuccino bottles. Peel off the label and replace with some DSP and a few stamped images. Punch, punch, tie the ribbon and your done. 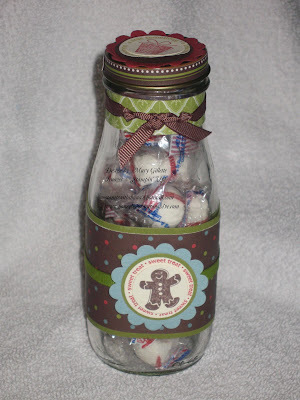 Fill with sweet goodies and you have a perfect gift for teachers and others on your list.